Stylishly furnished 2 bedroom/2 bathroom condo on the golf course at Ironwood Country Club, a prestigious gated desert community. Relax by the pool or take shade under the lovely citrus trees in the back yard of this gorgeous and tranquil retreat. There are no stairs in this single-level unit, with no unit above or below. Everything in our home is like new. The furniture, beds, stainless steel appliances, fixtures, bedding and supplies are all like new and in great condition. Enjoy wireless internet, High Definition TV (with PVR) with dozens of extra channels and digital music, free long distance telephone calls within the USA and Canada, and in-suite laundry. Close to El Paseo, the best of Palm Desert shopping and dining, as well as The Living Desert and other local attractions. Amenities include flatscreen LCD TV's in each bedroom, a stereo with CD player and IPOD dock, a fully equipped kitchen, and high quality linens, towels and bedding. The kitchen is fully stocked with dishes, pots and pans, wine glasses and anything you might need to cook a lovely dinner to enjoy on the patio or at the dining room table. This condo is well-maintained and very clean. Enjoy the tremendous mountain views from the back patio, which is right on the golf course. Plenty of recreation nearby, including dozens of golf courses, tennis and shopping. If you want to stay closer to home, spend the day at the pool and hot tub, which are just steps away. You will enjoy your stay with us! Condo is on a par 3 hole on Ironwood Country Club. Watch golfers play the hole, from tee box to green. There are three cordless telephones. Telephone in kitchen plus one in each bedroom. Washer is in the unit. Free long distance within North America. Fully stocked kitchen includes dishes, cookware, knives, basic supplies, etc. 42" LCD flat screen with HD Box TV in living room. 19" LCD flatscreen TV's in each bedroom! Nice condo, clean with new furnishings. Overall, we enjoyed our stay here. The owners were very prompt in responding to any questions or needs we had during the six weeks we were there. 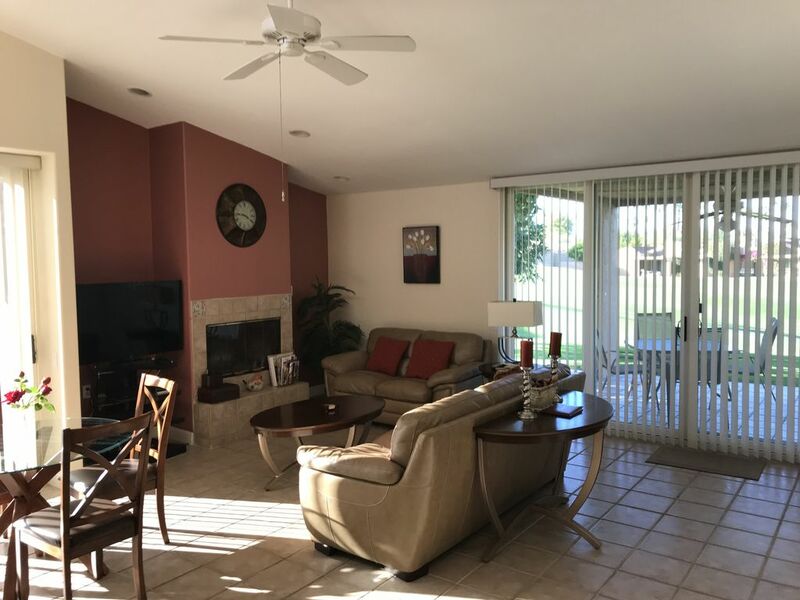 Perfect location if you want to enjoy all day shade on the patio which faces the golf course. We love Ironwood CC and the easy access to downtown Palm Desert and The Living Desert Zoo. Ironwood is up above the city near the mountains with beautiful sunset views. Loved having access every day to fresh grapefruit and lemons from the trees near the patio. We walked daily and also used the fitness center and the golf facilities. You have to pay extra to join the club; however, it is well worth it if you want to golf, play pickle ball, tennis or work out. Very friendly community with both full time and part time residents in single family homes and condos. We always enjoy our time in Palm Desert...great golf, great restaurants, great shopping and wonderful weather! We have loved our 2 month stay in this condo. It is within a quick walk to the fitness center and relatively close to the club house. Our view from the patio of the golf course is one of best in this section of Ironwood. The beds are comfortable as are the furnishings. The owners are particularly pleasant, responsive and easy to work with. My husband and I just spent 3 weeks in this lovely townhouse overlooking one of the beautiful Ironwood fairways. We were very comfortable, slept beautifully in the quiet atmosphere & comfortable king bed, and found all the comforts of home, including a well equipped kitchen. We loved the abundance of natural light & patios with citrus trees. Owners were great! Thank you Ravina and Ross for sharing your sweet enclave. We'd love to return. Just spent the past month in this lovely palm desert retreat! We had a blast! The weather on a daily basis was outstanding! The mountainous area is gorgeous. There is soooo much to do: Living desert, Joshua National Park, museums, street fairs, fantastic shows at the McCallum Theatre, once a month art walks along El Paseo, shopping & dining in Palm Springs....and of course, swimming, etc., etc.. Thank you to our host & hostess for making this memorable vacation happen. My husband and I spent three months enjoying the sunshine in Ironwood. The villa was clean and well maintained. The beds were very comfortable and we loved sitting on the back patio watching the golfers. The owners are very responsive to any issues and always willing to provide extra service if needed. I will miss the grapefruits every day fresh from the tree near the villa, what a treat to start my day! Lodging Tax will apply to stays of 27 days or less.